Rev. 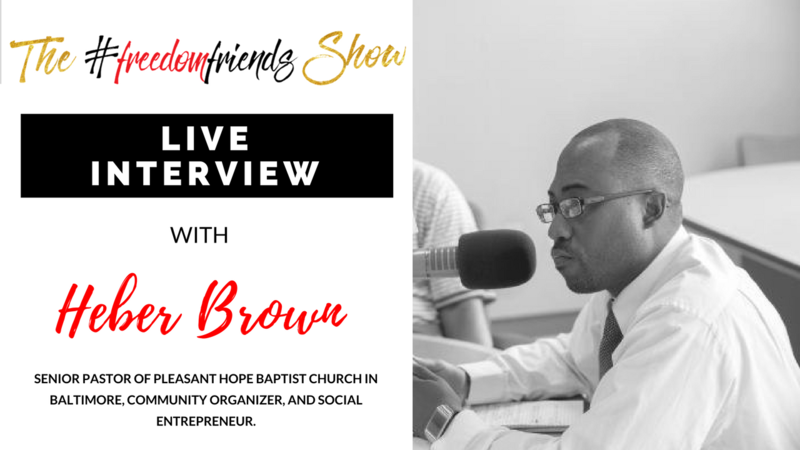 Dr. Heber M. Brown, III is a Senior Pastor of Pleasant Hope Baptist Church in Baltimore, Founder of OritasCross, Community Organizer, and Social Entrepreneur. Heber and I have a wonderful time as he talks about the emphasis of spiritual aspect that should be learned by our new generation and he collaborates entrepreneurship by virtue of the knowledge they may learn from spiritual and secular institution. The importance of spiritual knowledge. How to become a good organizer? The benefit of striving hard to make a good success of enjoying the pedestal of life from the bottom of sacrifice. What will happen when social discrimination be eliminated? How curiosity ignites our interest for a certain thing? Rev. Dr. Heber M. Brown, III is the Senior Pastor of Pleasant Hope Baptist Church in Baltimore and a Team Leader of Baltimore United for Change – a coalition of activists and grassroots organizations working for social justice. As a clergy-activist, Dr. Brown has demonstrated a deep commitment to a myriad of social justice issues from poverty, to racism, the prison industrial complex, worker’s rights, environmental justice, sexism, food sovereignty and foreign policy. Dr. Brown is a community organizer actively involved in legislative advocacy as well. Between 2009 and 2013, he was a central figure in the campaign to halt the construction of a $100 million dollar youth jail in Baltimore and currently he is working to strengthen police accountability in the state of Maryland. Beyond his direct involvement in the pressing social issues of today, Dr. Brown is committed as well to grooming and mentoring the next generation of change makers. Toward that end, he is the Founding Director of Orita’s Cross Freedom School – a multi-site youth development program which reconnects Black youth to their African heritage while equipping them to serve their communities. In 2015, he launched the Black Church Food Security Network which links Black Churches and Black Farmers in partnership to create a community-controlled, alternative food system based on self-sufficiency, food justice and food sovereignty. He earned his B.S. degree in Psychology from Morgan State University, a Master of Divinity degree from Virginia Union University and a Doctor of Ministry degree from Wesley Theological Seminary.